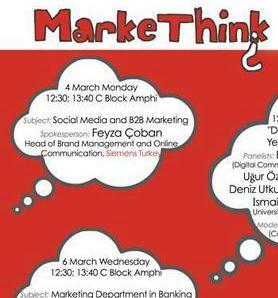 The Management and Economics Club (MEC) is holding MarkeThink Days 2013 this week, March 4-8. The marketing sector, and new trends and strategies within the sector, are being discussed throughout the week. Those who are not involved in sales or marketing may also be interested, as this event will provide an opportunity to learn about how sales and marketing strategies are developed. Here's something to consider: much of what you see during the day and pass off as random is actually carefully planned by marketers. For example, most logos are red, except those of banks, which often use navy blue or green. Turning to pricing, most prices are not given exactly, but as longer numbers, such as 9.99. You might also be interested in knowing how a specific behavioral pattern, such as the fact that people don't usually buy popcorn at the beginning of a movie but instead during the break, can be used to sell a product. For further insights into these ideas, and much more about marketing, everyone is welcome to MarkeThink Days, with sessions starting at 12:40 p.m. every day this week. Students taking GE 250/251 will receive 20 points per session. Those who attend all five sessions will receive a certificate. Please keep in mind that the discussions will be held in Turkish. Panel Discussion: "Dijital Pazarlamaya Dair Yeni Şeyler Söylemek Lazım"
Subject: "Marketing in the Banking Sector"
Panel Discussion: "Logoyu Büyütmeden Marka Olmak"